This season, there are three new faces on the Ottawa Senators that were acquired in the offseason via trades. In fact, they all came from the same team – the San Jose Sharks. Mikkel Boedker, Chris Tierney and Dylan DeMelo were all playing in California last season, but will now be braving the Canadian winter in Ottawa. While it’s a big change, both in the distance between the two teams and the climate, the players have seemed to find themselves at home with the Sens. 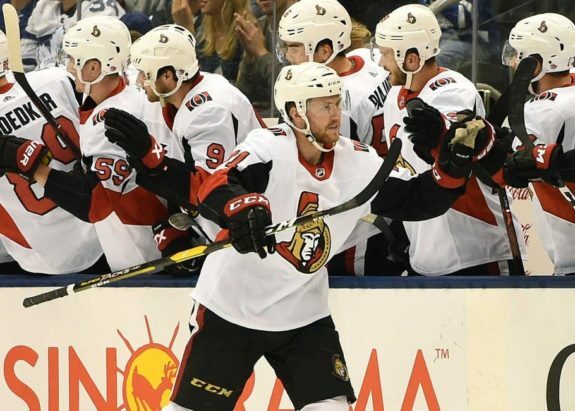 On June 19, the Senators received Boedker in a trade that sent Mike Hoffman, Cody Donaghey and a fifth-round pick to San Jose for Boedker, Julius Bergman, and a sixth-round pick. Hoffman was then flipped by the Sharks to the Florida Panthers along with a seventh-round pick for second, fourth, and fifth-round picks. Three months later, on Sept. 13, just before the preseason started, the team moved team captain Erik Karlsson to the Sharks as well, along with Francis Perron. They received Tierney, DeMelo, Rudolfs Balcers, Josh Norris, a second-round pick, and three conditional picks. Through Ottawa’s first eight games, the trio of former Sharks have quickly proved themselves, providing offence along with solid defensive play. As a fun fact, Hoffman and Karlsson have combined for eleven points and a minus-eleven. Boedker, Tierney and DeMelo have a combined 20 points and are a plus-seven. Senators fans have to be happiest about the play and production from Tierney – with two goals and nine points, the former Shark is second on the team in points and leading all forwards. Only Thomas Chabot has more, with ten points, but that shouldn’t come as a surprise to anyone. Tierney is coming off of a career year in San Jose, collecting 17 goals and 40 points over 82 games. The Keswick, Ontario native largely flew under the radar with the Sharks, playing behind players like Joe Thornton, Logan Couture, Joe Pavelski and Brent Burns. But now in Ottawa, Tierney has a chance to build on his best season. With Jean-Gabriel Pageau out until possibly March with a torn Achilles’ tendon, Tierney has taken over the role as the team’s second-line centreman. He’s also on the team’s second power-play unit, already scoring four points, tied for the top on the team with the impressive Maxime Lajoie. For the foreseeable future, Tierney will continue to be relied upon for his offence. He has gained the confidence of the coaches, averaging 17:55 per game compared to 16:00 last year, and he’s gained the confidence of the fans as well. It’s not just Tierney lighting the lamp, Boedker has been chipping in as well. So far, the Dane has two goals and six points, while moving up the left side of the top-nine forwards from the third to the top-line. The 28-year-old is in his eleventh NHL season and is a much-needed, experienced veteran on a team in the first year of rebuilding. On the success of the three former Sharks, Boedker said, “You never want to get traded and you feel a little left out when you do get traded. So, you play with a bit of an edge.” (from ‘Trades Proving to be Quite the Spark for Trio of Sens’, Ottawa Sun – 10/19/2018). Boedker is also being used in a bigger role compared to last season, averaging 15:02 compared to 13:21 in San Jose. The left winger touches on his, Tierney’s and DeMelo’s expanded playing time, “That’s probably one of the things, too, you get a bigger role. You either thrive in that role or you don’t. So far, I think all three of us have been good. The fans have embraced us and it’s always nice to feel welcome. 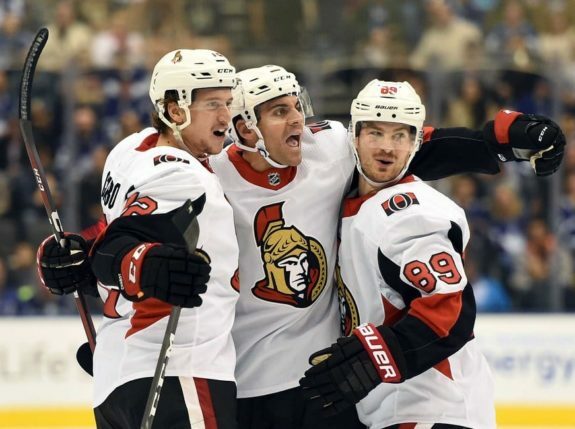 You just want to play your game and help the team win.” (from ‘Trades Proving to be Quite the Spark for Trio of Sens’, Ottawa Sun – 10/19/2018). The veteran’s play has been solid so far and while he may not finish the season with a higher point total than Hoffman, Boedker provides experience on a rebuilding team and the production he’s providing doesn’t hurt either. DeMelo has surprised in Canada’s capital, playing on the top defense pairing with Chabot. His play has impressed at both ends of the rink and has resulted in him playing almost four minutes more per night than last year – 18:04 instead of 14:12. DeMelo has a goal and four assists so far, and, considering his career-best for goals is two and points is 20 (all assists), he’s off to a great start. The 25-year-old’s best stat so far though is his plus/minus. DeMelo leads the team as a plus-six on a club that has the tenth-worst goals against per game (3.6). He’s still young and has provided a great contrast to Chabot’s offensive ability on the top line. If his play continues, he should be a Senator for a long time. DeMelo is in his fourth NHL campaign, and the most games he’s played in a season is 63. A full season on the Senators top pair should see him surpass his previous career-highs. Tierney, Boedker and DeMelo will be under the microscope all season, being compared to Erik Karlsson and Mike Hoffman. While they may not compare head-to-head come season’s end, they’ve settled in well in Ottawa and have played better than expected. With the three of them gaining serious minutes for the team, they should continue to put up the points and impress.